A digital thermometer in our garden that is not in direct sunlight and installed in a protected area just about a foot off the ground is reading 118°F and rising. Heck it was only 116° yesterday! The lawn that gets mostly sun is on a flex schedule and going to run each morning for the next 4 days until on Saturday when the temps are predicted to cool off to 102°. The lawn looks great even in this heat. Thanks Rachio! @sunny From your description Arizona in the summer in my mind is this. It’s not like that every summer. Only the ones when we have excessive heat. Same here @sunny. My lawn is predicted to go every other day, but just barely. I wouldn’t be surprised if it irrigated a few days in a row. Last week it was every 3rd day. The shrubs are currently at every 5 days, even with the heat. I can’t imagine using my old school controller anymore as it would be such a waste. I would’ve had to over-water constantly or risk losing vegetation during weeks like this. 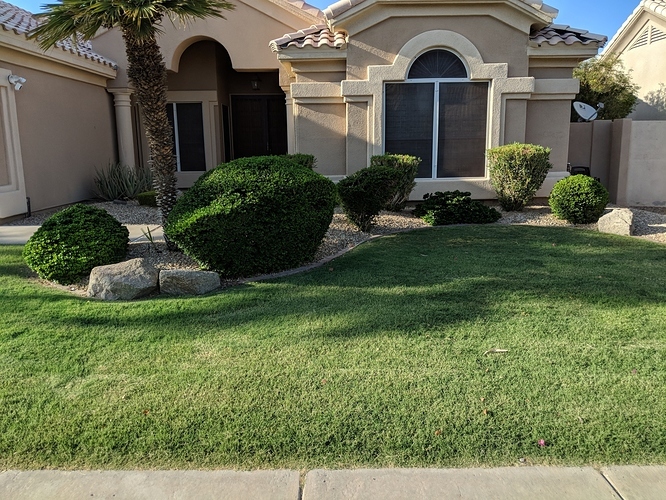 You’re lawn looks great @azdavidr - even when is 116 degree weather everything looks happy you’re landscape looks awesome. High 90’s in the forecast for Friday fellas! Get your parkas out!